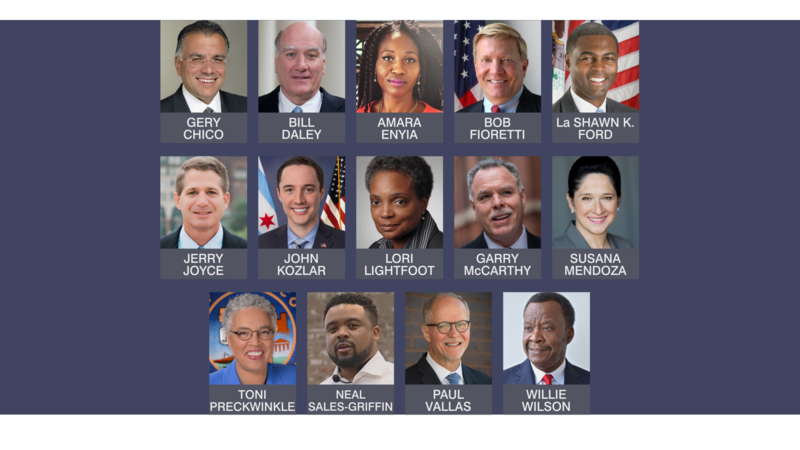 The 14 candidates running to be Chicago's next mayor are entering the final stretch of the campaign, with early voting already underway. The election itself is in three weeks, on Feb. 26, which means it's crunch time for candidates to get their messages across. Many have attended dozens of debates and community forums. Paul Vallas’ team counts 45, including the latest, sponsored by the North River Commission, which takes place Tuesday night at Theodore Roosevelt High School in Albany Park. Lori Lightfoot’s campaign manager estimates she’s been to 30 forums, with at least 10 more ahead. Willie Wilson and Susana Mendoza were supposed to be in attendance, but recently backed out. Mendoza is instead hosting a State of the Union watch party with supporters at her campaign headquarters. Organizers say that Gery Chico and Toni Preckwinkle previously said they wouldn't be at Tuesday night's forum, and they never heard back from Bill Daley or Neal Sales-Griffin. Sales-Griffin has only been a verifiable candidate for two weeks; he won a petition fight at the end of January. At the time, he said he knew he would have a whole lot of catching up to do, but he was ready to dig in and get started. But he has been noticeably absent from many of these forums. He was the only candidate not to participate in Chicago Sun-Times editorial board sessions earlier Tuesday. Things got heated, as candidates sparred about issues like corruption, sexual harassment and the new consent decree that will govern practices of the Chicago Police Department. Former CPD Chief McCarthy raised eyebrows with his answer to how to bring more revenue into the city. One of his proposals is to annex surrounding suburbs. He also named Norridge, Schiller Park, Evergreen Park and Oak Lawn.